Hope's Cafe: A Must-Have: Turbie Twist Review and Giveaway!! Wow, the product I am about to share with you is one that I quickly became fond of! I received a Turbie Twist and Turbie Band for review, and I am so thrilled! Honestly, I am wondering why it took so long for someone to come up with this idea! The Turbie Twist is a hair towel, made of super-absorbent material. I have to admit, I have never blow-dryed my hair unless it is absolutely necessary...I don't like the damage, and, quite honestly, I just don;t have the time. So, I usually use a bath towel to dry my hair, and then it takes between 1-2 hours for my hair to completely dry. So, the morning after receiving my package, I was anxious to try this out. It was AMAZING! The Turbie Towel features a tapered design so it perfectly fits every head, every size. My favorite part is the little loop so you can hold the towel in place...no more towel slipping off or unwrapping. 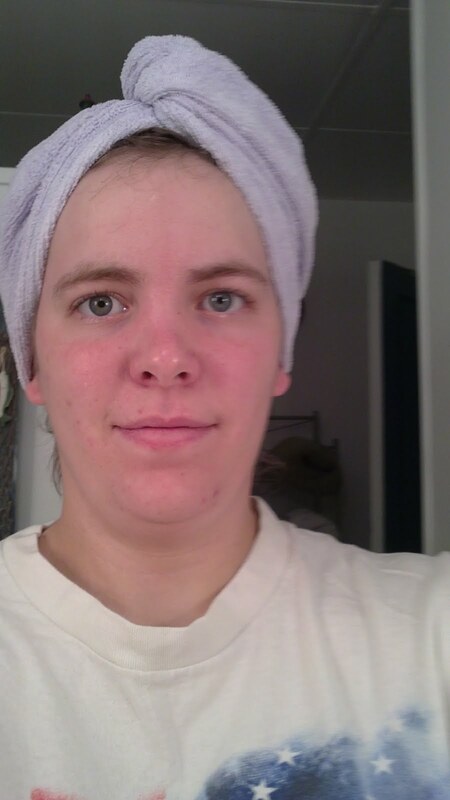 The Turbie Towel stays in place, and really does dry my hair much faster than using a regular towel. It is very lightweight (which means less strain on your neck). I hang mine up every morning after use, and it is totally dry and ready to use the next morning. This is definitely a product that I will be using over and over, and replacing when necessary! The second product, the Turbie Band, is just as much of a necessity for me now :) The Band makes it easy to cleanse my face every evening before bed. Basically you slide the Band on just like a headband...down around your neck, then pull up and around your ears, adjusting as necessary. But, the best part is that you tuck the rest of your hair up into the back of the Band. So I don't have hair falling into my face now when I'm washing it! This would also be great for women who have trouble while applying makeup, etc. Another fantastic product! The winner of this giveaway will receive the Turbie Twist website special...4 Turbie Twist Towels and 1 Turbie Band!! Go to the Turbie Twist website, and tell me your favorite feature of this product! 1 entry-"Like" Turbie Twist on Facebook and tell them you entered the giveway at Hope's Cafe! 1 entry-Follow Turbie Twist on Twitter! This giveaway ends Tuesday, May 24, 2011, at 11:59 p.m. Please leave a valid email address in each comment, as this is how the winner will be notified. Winner will have 48 hours to respond, or another winner will be chosen. Disclaimer: I was not monetarily compensated in any way for this post. All thoughts and opinions are mine. All quotes taken from the Turbie Twist website. I love that the Fun! Turbie Twist Prints come in something other than the standard solid colors. I love the colors/designs...I didnt know they had any! I love that it is lightweight and can stay in place! I Follow You by RSS Feed! I follow Turbie Twist on Twitter! I like that it stays put once you put it on. I like that it works for long hair. I would love to win. I liked them on Facebook and told them I entered your giveaway!